Self-driving cars are coming, and Tesla CEO Elon Musk has been pushing his engineers hard to make sure that Tesla stays on the cutting edge. 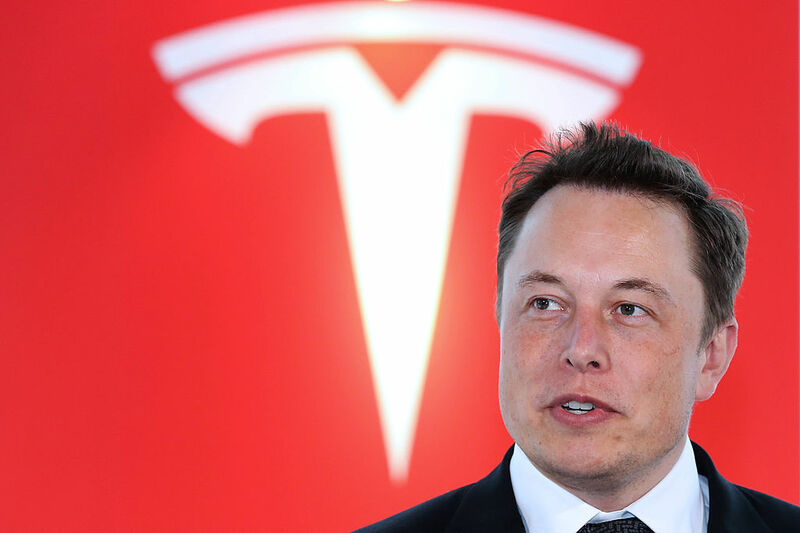 Indeed, in October 2016 he promised that the latest version of the Model S and Model X—cars with Tesla’s new “Hardware 2” suite of cameras and radar—would become capable of full self-driving in the future, with just a software update. But according to a new report from the Wall Street Journal, some Tesla engineers are skeptical that Tesla can keep this promise any time soon. Disagreement about deadlines—as well as “design and marketing decisions”—is causing turmoil inside the company. Back in April, we reported on Waymo’s plans to offer an autonomous ride-hailing service in Phoenix, Arizona. 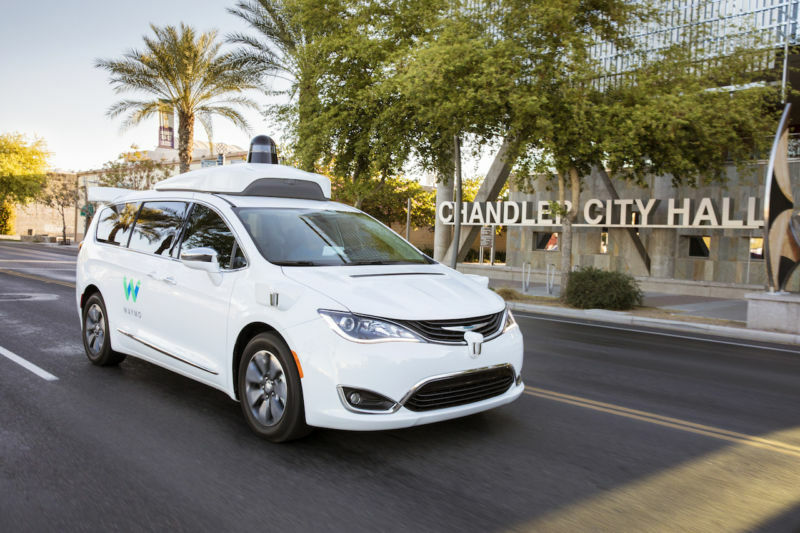 The project has been spun off from Google’s self-driving car project, and Waymo is using a fleet of adapted Chrysler Pacifica hybrid minivans to perfect its self-driving technology. Today, the company announced it is entering into a deal with the rental car company Avis to service and store the vehicles. Autonomous ride-hailing services are being viewed by car and tech companies as a potential gold mine in a near future where car ownership is losing its luster. 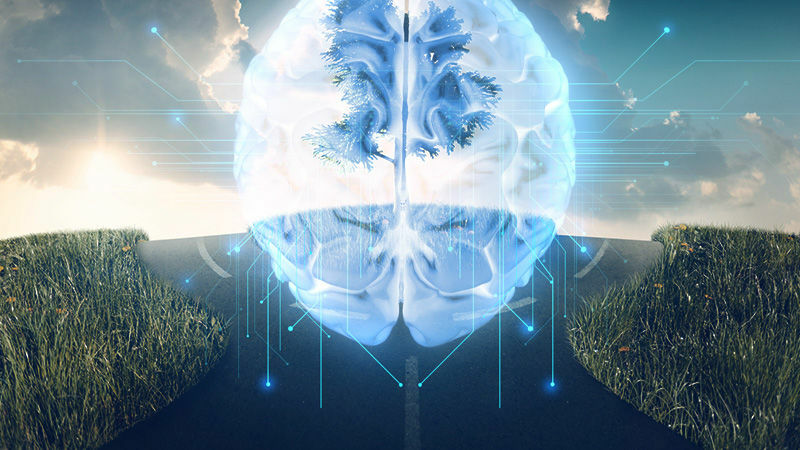 Instead of selling autonomous vehicles directly to the public—which will happen eventually—operating the fleets themselves means they can be commercially insured, solving (for the time being) one of the big unanswered questions about the evolving technology. 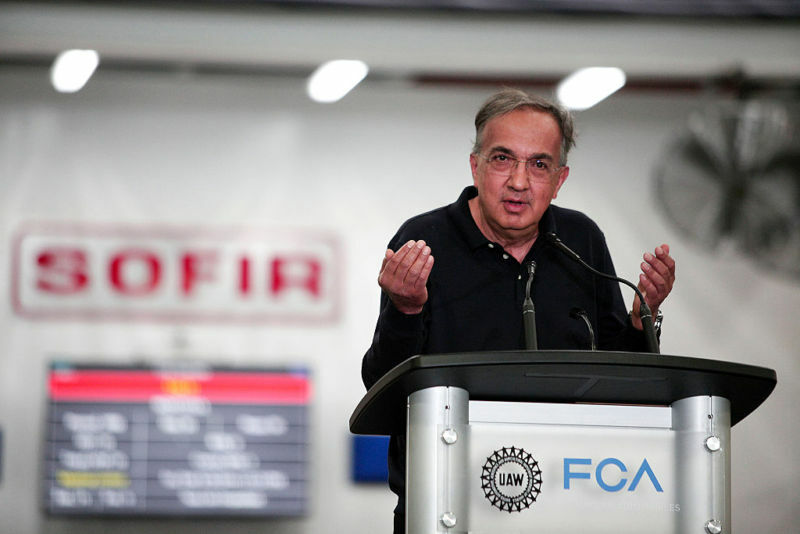 But owning and operating a fleet of vehicles is easier to do if you’re a car manufacturer with the resources and experience already in-house. Hence this Waymo-Avis deal. Waymo will own the autonomous test fleet and will pay Avis to look after the vehicles. The move proved to be quite positive for the latter’s share price, which rose by 12.5 percent this morning once news broke. That’s understandable, as the rental car industry is one that could be seriously affected by the arrival of autonomous vehicles, although it’s worth remembering that for the first few years, such services will be geofenced to certain metropolitan areas. The self-driving car reached something of a watershed in 2016. All of a sudden, it seems we’re right on the threshold of autonomous vehicles transforming our transportation. I’d ask any engineer in 2015 when they thought we’d have full (i.e., SAE level 5) self-driving vehicles and the answer was always “ooh, that’s another 20-30 years away.” Fast forward a year, and all of a sudden that target has moved: BMW, Intel, Mobileye, Uber, Volvo, Ford, Delphi, and others have all set 2021 (or earlier in the case of Delphi) as the year by which steering wheels become optional. Nvidia’s deep neural network allowed BB-8 to figure out how to drive on and off road in a short amount of time. But along the way, the automakers and tech firms working on the problem have diverged into two groups: the ones who plan to get there in an incremental, stepwise fashion, and the others who plan to skip the intermediate step. Autonomous driving company Comma.ai announced via its Twitter feed this morning that it would be canceling its forthcoming Comma One product. Comma One was supposed to bring after-market autonomy to third-party vehicles. The company was founded by hacker George Hotz (aka Geohot), who is credited as the first person to hack the iPhone. In his tweets under the Comma.ai account, Hotz said that he decided to discontinue production after he received a stern letter from the National Highway Traffic Safety Administration (NHTSA) requesting more information about how the product works and safety precautions built into the technology. “First time I hear from them and they open with threats. 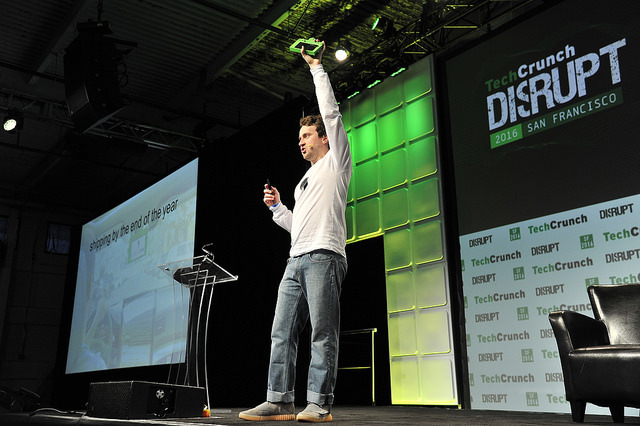 No attempt at a dialog,” Hotz tweeted with a link to the NHTSA’s 10-page letter. “Would much rather spend my life building amazing tech than dealing with regulators and lawyers. It isn’t worth it,” he added. A frequent topic on these pages concerns Silicon Valley and its ongoing attempt to disrupt the car industry. But over in Europe, a former Ferrari F1 engineer has some thoughts of his own on the matter and thinks his company—Cogisen—has a better way of doing things. 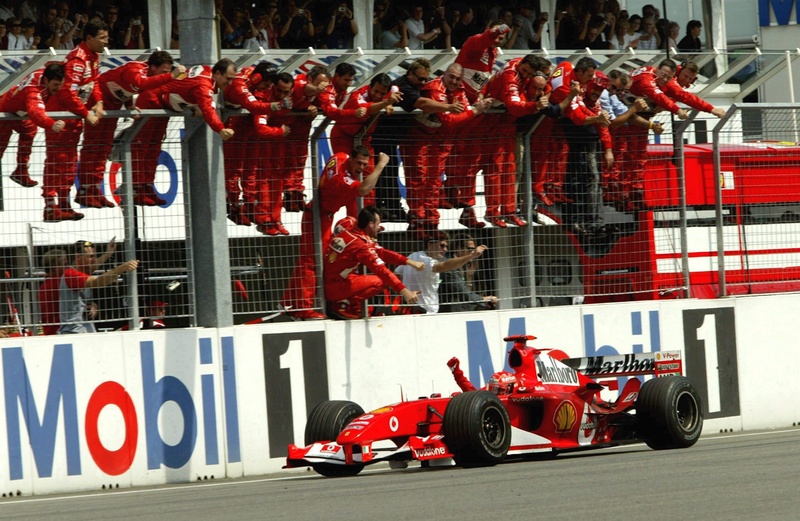 Christiaan Erik Rijnders spent several years in the early 2000s working on Ferrari’s simulator, simulations, and vehicle dynamics, during which time Ferrari utterly dominated the sport. Through that work, he absorbed a few important lessons on the way successful R&D programs should run, and they’re lessons he’s been applying more recently to the problem of image processing. In particular, Cogisen has some very cool gaze-tracking algorithms (earning the startup a Horizon 2020 grant from the European Union) that may have an important role to play in autonomous vehicles. We spoke to Rijnders recently to find out more about his time at the Scuderia and to talk about where he thinks most traditional tech startups are going wrong. Credit: MIT SENSEable City Lab. A recent paper co-authored by MIT researchers did the math on how best to allow competing traffic through an intersection. The results, published in the open-access journal PLOS ONE, suggest that once cars can connect to city infrastructure, traffic lights will be a suboptimal way to regulate traffic through city streets. Instead, the paper suggests, cars should talk to computers at intersections and be allowed through the crossing via a slot-based system, without the need for yellow lights. Better yet, once fully autonomous vehicles hit the road, even greater efficiencies could be realized by having the cars talk to each other to form platoons that move through intersections. The researchers start by acknowledging the inadequacies of the 150-year-old traffic light—at any given intersection, they say, there are so many variables that any one breakdown in the flow of traffic can be disastrous for the whole intersection. “This explains why traffic can rapidly deteriorate in cities, resulting in widespread congestion and immense societal and environmental costs,” the paper notes. 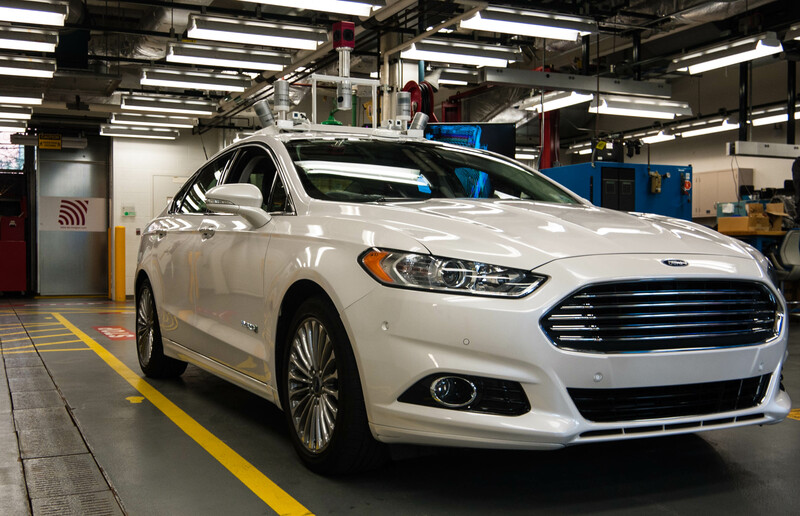 We navigated the warren-like maze of corridors on our way to a workshop to meet some of the company’s self-driving research vehicles, led by Randy Visintainer, Ford’s head of autonomous vehicles. The workshop itself looks like a cross between a garage and research lab. Fume cupboards and lab benches share the space with three white Ford Fusion hybrids. These are Ford’s autonomous driving research vehicles, and Visintainer—along with Jim McBride and Doug Rhode—is here to show off the technology that makes autonomous driving possible. From the outside, the cars look almost entirely stock other than the sensor bars mounted to the roofs. These are studded with Velodyne lidar scanners or pucks. Each one of these is packed with lasers—which illuminate the sensor’s field of view out to around 300 feet (100m)—and detectors that sense the reflected laser light. As configured during our visit, two of the sensors are mounted horizontally, and another two are angled down at about 30˚ to be able to scan the road around the vehicles. On Tuesday Ford detailed its roadmap to building cars for the future, and that plan involves putting lots of cameras and sensors on new models. Notably, the company said it would be moving its work on autonomous cars from the research department to advanced engineering, begin wearable technology development, and introduce a new split view camera to help drivers see obstacles coming in from the side. Ford said it plans to increase the number of augmented driving functions in its cars over the next five years. It also said it would begin work on making the sensors and computing power necessary to run a fully self-driving car feasible for production. The company already has models that use functions like parking assistance, rear cross-traffic alert, lane-keeping assistance, and blind spot monitoring. But Ford faces intense competition in the autonomous vehicle space: companies like Audi and Volvo have been experimenting with active driving assistance for a long time, and Google and Delphi have already logged hundreds of thousands of miles testing fully self-driving cars. Last night, on the Hoover Dam, Freightliner (which is owned by automotive giant Daimler) unveiled the first road-legal self-driving truck. At the event last night, the Inspiration Truck (yes really) was awarded an official autonomous vehicle license plate by the governor of Nevada. Sadly, there was no mention of pricing or commercial availability—but it won’t be particularly soon. The license plate is a step towards lots more testing on the roads of Nevada… and then we’ll see what federal regulators think about fleets of self-driving trucks. The lorry has the same “NHTSA Level 3” rating as Google’s self-driving car, which means that it’s fully autonomous, but that the driver still has to be able to take over “with sufficiently comfortable transition time” if the need arises. In this case, while the Inspiration Truck could drive itself for hundreds of miles without driver intervention, Daimler is framing this as a conversation around driver fatigue. According to Daimler, 90 percent of truck crashes are due to driver error, and driver fatigue plays a role in 1/8th of those crashes.